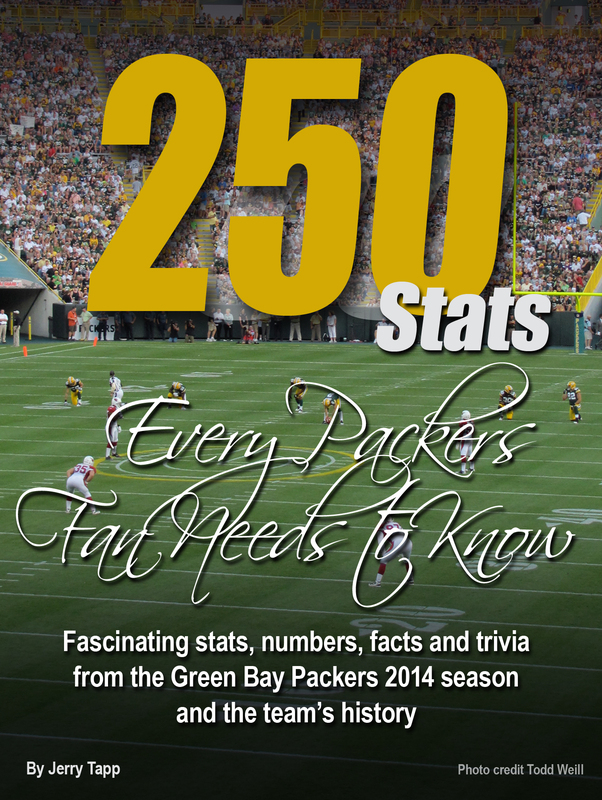 Over the next weeks until the 2015 NFL season starts on September 10, I will be posting some stats from my book, “250 Stats Every Packers Fan Needs to Know.” It is now available in ebook form through Amazon and Barnes and Noble; cost is $9.99. Printed copies should be available in a couple of weeks. 3 Did you know that fullback John Kuhn is one of only three offensive players since 1966 to have 20 or more career TDs with less than 1,200 career yards from scrimmage? Kuhn has 21 TDs and 1,107 yards from scrimmage in his nine-year career (eight years with the Packers). The others on the list: Roman Gabriel (24 TDs, 990 yards from scrimmage) and Hank Bauer (20 TDs and 474 yards from scrimmage). 7 Did you know that defensive back Sam Shields is one of five active players who has 15 or more career interceptions but has never returned an interception for a TD in his career? The NFL record is 50 interceptions without an interception returned for TD by Don Burroughs, who played in the league from 1955-64. The Packers record is 31 interceptions without a return for TD by Mark Lee. Shields has 15 career interceptions. 18 Aaron Rodgers and Jordy Nelson connected on 13 pass TDs this past season, giving that combo 45 for their Packers careers. The pair is now in second place in Packers history, passing the combination of Brett Favre-to-Sterling Sharpe for the second spot on the list. Favre-to-Antonio Freeman is the most prolific pass combination in Packers history with 57 TDs passes. 34 Aaron Rodgers had five games in 2014 where his pass completion rate was under 60%. The Packers were 2-3 in those games (losses to Buffalo and Detroit in the regular season and a playoff loss to Seattle; wins over Miami and the Jets). The Packers are 9-16 (.360) in games where Rodgers’ pass completion rate is under 60% in a regular season game; they are 1-2 in playoff games. 55 Did you know that Packers receiver Randall Cobb is among the best in NFL history when it comes to running the ball? Of players who have carried the ball 25 or more times in their career, Cobb has averaged 9.3 yards per carry (27 carries for 252 yards). That ranks fifth all-time. Louis Lipps has the best yards per carry average in NFL history with 13.9. Cobb is one of only seven players in NFL history with a per carry average over nine yards. Cobb obviously leads the Packers in that category with his 9.3 average. Ranking second is James Lofton (7.9 yards per carry), followed by Donald Driver (6.4 yards per carry) and Joe Francis (6.1 yards per carry).